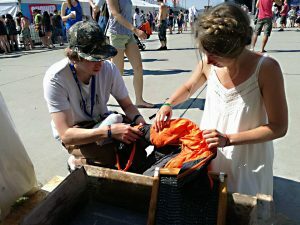 When visitors to POHODA festival noticed a tent with the inscription Laundry, they looked on it was though it was a UFO. Looking on and equally surprised at seeing positive feedback was one of the authors of the project from Valaská, Ivan Mako. A large white tent named Práčovňa, and just to play safe also named Laundry, seen for the first time at the POHODA festival was without doubt a surprise. Some young Roma were testing their promising pilot project of social enterprise that operates in the community centre in Valaská near Podbrezová. The community laundry offers employment and provides a livelihood to 25 people in Valaská, regardless of origin. The Roma offer a model social operation also to the state. Mako says that if systemic social economy expanded social, hundreds of people, particularly in rural areas, would find employment. “People at the festival looked at us as they would a UFO. They expect to see anything here, except for a laundry, “says Ivan Mako from the Association of Young Roma. Jana Majchútová is not a Roma. This young 33-year-old was unable to find any work after maternity leave. She worked in the local forests and on part-time jobs. The worst time was in winter. Then, through the activation work programme, she was sent to the community centre in Valaská. She did everything there from building work in the courtyard to tidying-up. After roughly a year, Ivan Mako made her the laundry manager with a permanent contract. “Not really the manager, forewoman is a more accurate title” she corrected her boss, as she organizes and manages the work in the laundry and communicates with clients. This is a woman who a year ago was drifting from agreement to agreement and has now sold this project at POHODA festival. It is said that when the first visitors came and saw the laundry, the majority said “whaaaat?” And left. However, they later came back and had things washed. “It was really great to see how the young people took to us. We did their laundry, chatted to them, had fun,” said Jana Majchútová with undisguised enthusiasm. The Ekopolis Foundation offered these young Roma the opportunity to present a positive story of the long-term unemployed from the Horehronie region to festival-goers. 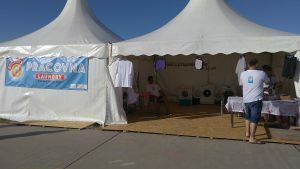 The Roma brought two washing machines, a dryer and a mangle and waited to see how the public would react. For four days they washed and ironed clothing and ironed stickers on t-shirts. All for free. If anyone wanted to, they could do their own washing in a wooden trough, just like the girl who got the hem of her skirt dirty. If you wanted to make a contribution, you could; if you didn’t want to, you didn’t. It wasn’t about the money. Ivan says that they came to POHODA festival to show a functioning community project of social entrepreneurship, especially useful in rural areas. They also offer this to the state as a model of economic recovery in a sleeping community. “We wanted to see in real-life how society perceives the services we provide in Valaská. POHODA festival showed that if you provide services at a standard level, society accepts them,” said one of the project’s authors. These and similar projects could occur throughout Slovakia, Mako says. They can offer services which might not be financially attractive for commercial companies but which are needed by the market. 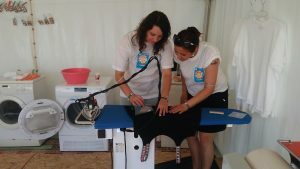 The laundry and ironing unit in the Horehronie Multifunctional Centre has been operating since last year. 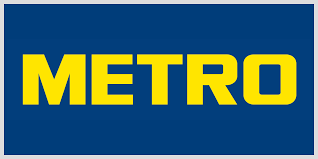 Through an e-marketplace the long-term unemployed, the disabled and marginalized have received business that enables them to earn a living. They work in two shifts. “We are not interested in the colour of someone’s skin, our doors are open to all who need jobs,” said Mako. With the help of funding and from foundations they virtually rebuilt the whole of the crumbling building and built the project on a simple philosophy. They do not want to take work from people in a poor region, but rather to bring it to Valaská from wealthier towns. These young Roma have not thought up anything new, only imported a tried and tested model from abroad. They were in Belgium to learn where difficult to employ people work in laundries, horticulture and sorting used materials. For example, in Solingen, Germany, they produce handcuffs for police and shears used on sheep and earn enough to live decently and enable their children to go to school. Original text written by Daniel Vražda, Denník N. Translated and published with his kind permission.